It’s a miracle we make it into adulthood alive. All the dumb choices, narrow misses and blind luck that get us through our adolescence can sometimes run us smack up against our worst enemy- ourselves. Success, failure, love and loss are amplified at that age, and it takes a couple of decades on Earth to finally realize that yes, this too, shall pass. If you know a young person that’s struggling with the transition into life as a human being, sometimes a little nature can be a big reminder of that great, big world out there, and how both beauty and life and all the good and the bad that comes with it, are a part of the experience. 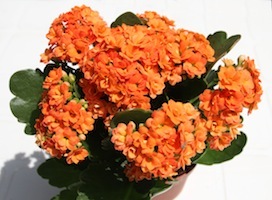 If you are looking for a potted plant that can say all that, look no further than the kalanchoe. Known for its showy red, orange, pink or yellow flowers, the Kalanchoe blossfeldiana is the most common species and can be found at your local florist or garden center as a potted plant. Easy to grow in a sunny window and tolerant of both neglect and and sudden moves, this plant is perfect for a tempestuous teenager that might have a hard time bearing the responsibility of a more finicky plant or find the eventual decay of cut flowers a bit too macabre. A strange, yet striking succulent from Madagascar, parts of Africa and pockets in Asia, there are over 125 different species of this small, flowering plant. In the Victorian language of flowers, it is said to symbolize celebration and popularity, which (though they would never admit it openly) top the list of desires for most folks in that age bracket. Most kalanchoe have large, thick, waxy leaves that are broad and green with the unique ability to develop new growth from the edges or from a single cutting of an old leaf. This ability to not just survive, but flourish after injury or disruption is a great reminder that change, while sometimes painful, is necessary for growth. A particular species known for this trait has the nickname, Mother of Millions, and produces tiny versions of itself along the margins of the leaf that will eventually fall of and grow into full size plants. Another unique cultivar, called the Panda Plant, is a narrow-leafed kalanchoe covered in white fuzz with black spots, resembling a panda bear’s markings. Able to store water in their leaves like other succulent plants, the kalanchoe is well adapted for periods of change and unfavorable conditions. They will do a great job reminding a kid in crisis that they, too, have this ability.